Huawei is entering the smart speaker market with the AI Cube. The AI Cube is, ironically, a high-end cylindrical 4G router and Alexa-powered speaker. 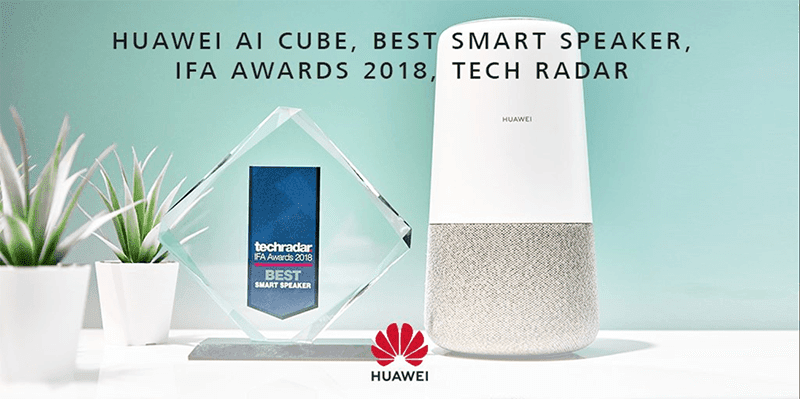 The AI Cube is Huawei's brainchild to infiltrate the smart speaker business. It is now ready to go toe-to-toe with the Google Home, Apple's HomePod. Amazon Echo speakers and Samsung's Bixby speaker. To separate itself from the competition, it included with an LTE SIM card slot to make it a 4G hot spot. It also has an Ethernet port that will make it into a home WiFi router with Alexa enabled. The AI Cube is 8.6-inches tall with a 4.57-inch diameter. It weighs 900 g. In terms of network connectivity, it can support LTE Cat 6 with speeds up to 300 Mbps. WiFi is 802.11 ac with dual-band WiFi. For a far ranging voice recognition, it has 4 microphones in total, 0.4L sound cavity and Huawei Histen. The sound quality was not demonstrated during the presentation with Huawei touting it to be a "groundbreaking device" with a "powerful sound system". Lastly, availability of the Huawei AI Cube is said to be around Christmas season in Europe. The US and China has no confirmation of availability. Prices are not yet announced with Huawei saying that announcement will be made close to the launch dates.